1994 Kawasaki Ninja ZX600E with 3500 miles purchased in 2000 from Weeks Cycle Salvage. Now owned by Darren Fairey (Owner of CCS Customs) Brought the bike to Georgia in 2001. The first Custom paint job was done in 2004. All of the factory graphics were removed and went with the traditional Lime Green and white pearl. When I got it all done, along with two helmets to match, my said "I don't like Green!" Two years later I completed the custom bodywork and final paint job. I took the bike down to the bare frame and repainted everything, frame, swing arm, foot rest brackets, triple trees, fork lowers, wheels, exhaust cans, etc... Custom fiberglass undertail (rear fender eliminator) shaved the rear seat lock and coolant recovery tank sight window in tail section. Next came the paint which was all done by me (Darren Fairey) as was all of the work. I wanted to paint it Yellow with a barbed-wire effect but as you may have guessed, my wife doesn't like Yellow. So Black it is and what to do next was again up to my wife. A suggestion of True Fire on the table... Starting to airbrush on a Sunday at 2:00 in the afternoon I was done with the fire at 11:00 that night. I never stopped and the next morning I loaded the bike up and took it to the shop for clear coat. By Wednesday that week all of the buffing was done and final assembly complete by the weekend. The following weekend took its first 1st place at a show in Atlanta, Ga.
Motor is still bone stock except for flow commander and custom arrow exhaust from a 2006 CBR 1000. Very reliable and smooth. Last dyno run was 87 HP, not bad for a 600. I have 2001 Kawasaki Ninja ZX6e. 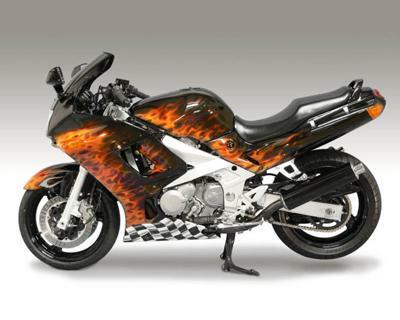 I need front fairing, please contact me 414-384-4416 or email salivaba1@hotmail.com if you have one. I live in milwaukee WI.